The Invoices/Tax Report (formally known as the Sales Tax Liability Report) is a summary of the sales tax information. Go to Reports < Invoices/Tax Report. This will bring you to the page where all your A/R Reports will be housed. The system will generate a new report showing total taxable and nontaxable sales, invoiced totals, subtotals, tax totals, and individual taxes ordered in columns and broken down by job and by personality. It will input it into the report list as “Finished.” From there you can view it, delete it, or download it externally as a PDF or an Excel Spreadsheet. 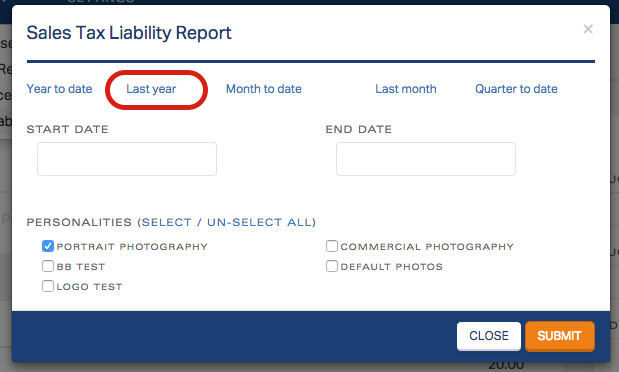 You also have the flexibility to choose how the report is ordered. If you click on any of the column descriptors, the report will arrange according to that classification. At the bottom of the report, you will find the aggregated subtotals in bold.